It goes without saying that Allen Iverson was an extraordinary athlete: Six feet tall (in sneakers), 160 pounds (soaking wet), the sinewy combo guard emerged from abject poverty in Hampton, Va., to become one of the most devastating finishers in NBA history. His creative, expressive playing style made him one of the sport’s biggest attractions—the Philadelphia 76ers routinely led the league in road attendance during his peak years—not least because any given night he could explode for 60 points. He played like young men act and feel: without boundaries, impulsively, fearlessly. He remains arguably the most YouTube-friendly player of all time: Even his deeper cuts, like when he broke Antonio Daniels’s ankles twice on the same play, can leave you slack-jawed. Yet basketball only tells part of the story when it comes to Iverson, who formally announced his retirement Wednesday more than 44 months after he played his final NBA game. The way Iverson polarized Philadelphia, sports, and America at large made him a vital counter-cultural icon of the ‘90s and ‘00s—a folk antihero for the millennial set whose impact on society is still being felt, both consciously and otherwise, more than a decade and a half after he first penetrated the mainstream. It didn’t take long for Iverson to make a splash in Philadelphia after the 76ers made him, at 20 years old, the top overall pick in the 1996 NBA draft. He crossed over Michael Jordan; he hung 19 on Kobe Bryant in the Schick Rookie Game; he dropped 50 on the Cavaliers—still a record for a first-year player. But three months after winning Rookie of the Year honors, he was arrested on marijuana- and gun-possession charges, the first of several run-ins with the law during his pro career. The festering criticism over Iverson’s lifestyle and his loyalty to his hometown friends—posse was quite the buzzword in Philly circa 1997—redoubled overnight. Yet even as he stumbled—and stumble he did—there was an authenticity to Iverson that made him a magnetic public figure. In an era of sanitized athletes with meticulously cultivated images, Iverson’s lack of filter made him an anomaly. He compromised for no one. Whether you loved him or hated him, you could not look away. His trendsetting cornrows, for example, were the Beatles’ moptops for the hip-hop generation, while his defiant tattoos became a national talking point and thinkpiece fodder. Iverson came of age in the unforgiving spotlight, and he would spend more than half his life there. He consistently led the league in misguided critics and was subject to more pop-psychological analyses than practically any other athlete of his era—as if the pressures of being a franchise player in championship-starved Philadelphia weren’t burden enough. “In this profession you have no idea how hard it is to live up to all the expectations, try to be a perfect man when you know you’re not,” he said. “Being in a fishbowl, everybody looking at every move you make, talking about everything you do—it’s just a hard life to live. “It’s a great one, he added. “I wouldn’t trade it for nothing. I have no regrets on anything. People ask me all the time, ‘Do I have any regrets?’ I don’t have any. If I could back and do it all over, would I change anything? No. "Obviously if I could go back and change anything I would be a perfect man. And I know there’s no perfect man." To the wider public, Iverson was either a thug who hit the genetic lottery or a misunderstood hero who couldn’t or wouldn’t outrun his past, and that’s a schism that tended to fall along generational lines. Either way, he was a savant and an icon: pound for pound the greatest to ever do it. Philadelphia is a place where people arguably care a little too much about sports, which made Iverson’s casual practice habits and reliance on natural ability a recurring point of criticism. Yet his countless displays of bravery on the court—watching him knife into the paint, carom off the elbows of linebacker-sized post men, score a bucket, and then bounce up to do it again—was his nightly penance for more than a decade. 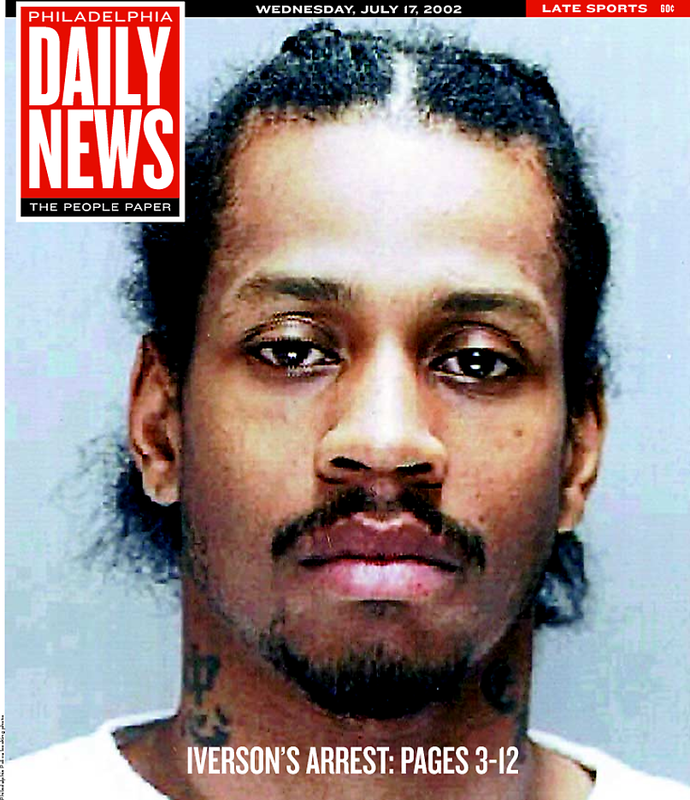 And like Joe Frazier and Brian Dawkins, Iverson was not from Philly but connected himself to the populace so completely that native status was conferred—in a mad but undeniable way, the provincial city's highest honor. He was original and influential enough a personality, for better or worse, to become an unforgettable figure in American life. He emerged for Wednesday’s announcement looking like he’d been crying. It was no secret that Iverson, now 38, had not retired so much as run out of options. It was an ignominious end. Yet he assured the masses there were no regrets: "I really thought this day would be a tough day for me," he promised, "but it’s a happy day." If Michael Jordan and Kobe Bryant represent the (false) ideal of perfection, Iverson unapologetically spoke to the frailties innate in us. He was private but candid. During his career, he enthralled, frustrated, inspired, and maddened; he was a contradiction in Reeboks. His shortcomings, literal and otherwise, made him accessible even as his freakish talent set him apart. He was beloved because he was fallible. “Anybody that wants to be me or wants to be like me, I would tell them not to be like me, to want to be better than me,” he said, and then he disappeared into the tunnel.